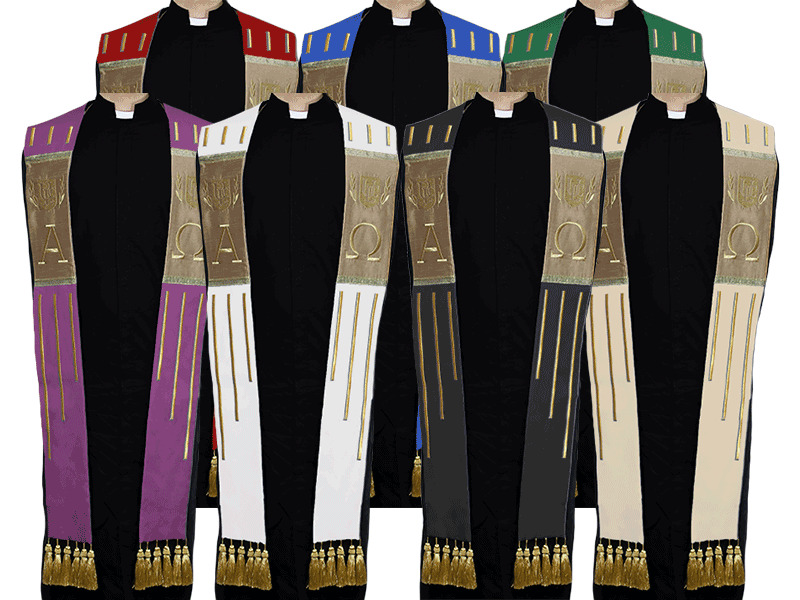 The minister stoles have the traditional gold stitching with tassels with Alpha and Omega symbols on each side. There are six colors to chose from. To help match the color scheme of any wedding, they come in several different colors including blue, green, white, red, purple, and ivory. They have been double stitched along every seam to ensure durability. This is the best way to add that professional touch while officiating a wedding or preaching at the pulpit. The stoles have a width of 5.5 inches, and the complete wrap around length is 134 inches. Traditionally stoles are worn by deacons, bishops, and priests, but they have become popular among Ministers officiating weddings. These are the official stoles for ministers ordained by the Universal Life Church. They feature reinforced, high-quality, gold stitching with tassels. They feature the ULC crest and the symbols for Alpha and Omega. You can drape these over your clergy shirt, cassock, or other formal wear.